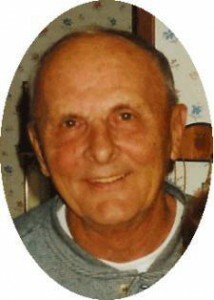 August F. Nuedling “Dutch, 73, of E Norport Drive, died peacefully at his residence on Sunday, December 28, 2003. He was born December 11, 1930 to Frederick and Eleanore Altman Nuedling in Milwaukee, Wisconsin. He worked as a Core maker for Motor Casting from 1947 – 1951 and then worked t Badger Meter in Milwaukee (where he met his wife) until 1955. He served in the US Army from 1953 to 1955 and when he returned home worked worked for Evinrude Motors until 1960. After his marriage he moved to Port Washington to work as a loader and distributor on the docks for Murphy Oil from 1960-1981 and later for Moore Oil until 1993. In 1998 he began driving for STS Handicap Services and in October of 2002 he drove for Johnson Taxi Service until November of this year. He also painted with his son Rick of R & M Painting. This past November he celebrated his 50th Anniversary. He was an usher at St. Peter’s and a member of the Van Ells-Schanen American Legion, Post # 82, Port Washington. Dutch is survived by his wife, Irene, and children Jay (Maria) Nuedling of Atlanta, Georgia, Jean (Ken) Klopp of Alexandria, Virginia, Kim (Patrick) Tilka of North Port, Florida and Rick (Maria) Nuedling of Port Washington, Wisconsin. He was the proud grandpa of Jennifer Bradshaw, Jim Klopp, Ashley, John and Whitney Tilka, Paul, Char,Mary, Anne, Sean and Erin Nuedling and great grandson Joshua Bradshaw dear brother of Gloria (Hubert) Tschachler of Hartford, Wisconsin and the late Judy Aussprung. Further survived by sisters-in-law Florence Beit of Wauwatosa, Wisconsin, Shirley Dalske of Saukville, Wisconsin and Pat (Harry) Franks of Anchorage, Alaska, other relatives and friends. Mass of Christian Burial Noon Saturday, January 3, 2004 at St. Peter of Alcantara Catholic Church, 1802 N Wisconsin Street, Port Washington, WI. Entombment parish cemetery. Visitation 10 – 11:30 AM Saturday AT CHURCH. Memorials to Port Catholic School appreciated.